PACKED WITH 5+ EXCITING FEATURES! LAUNCH PRICE of R499 ONLY VALID TEMPORARILY. Move slower. Meet the Chill Hoodie. The snugliest hoodie ever. Please make sure you triple check our size chart before ordering your size. At Youneek we don’t do ordinary. We go above and beyond to bring you clothing that will leave you in awe. The chill hoodie is no exception. 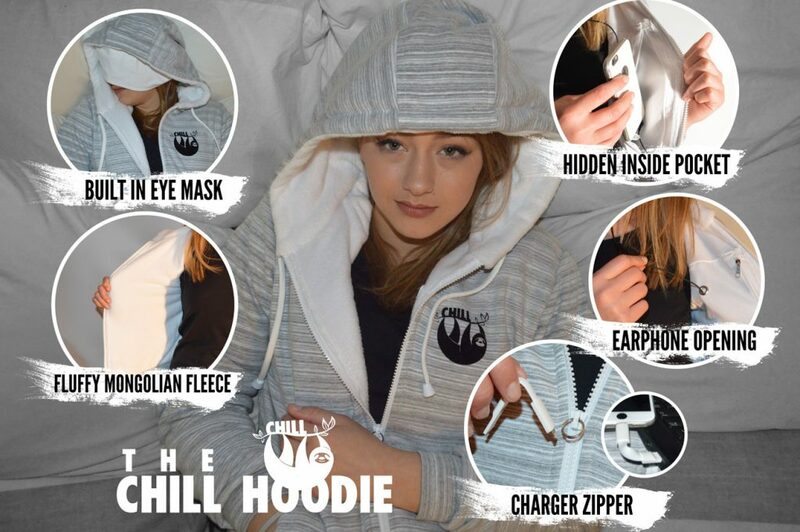 With extreme attention given to comfortability and a few added features to help you relax and “chill” like never before, the chill hoodie is the next step in the evolution of comfortable clothing! Built-in eye mask. You never know when you’ll need to take a quick powernap. With the incredible comfortability that the chill hoodie provides, it’s not a hard task, you’ll maybe just need to shut your surroundings out. Simply pull down the eye mask from the inside of the hood and block the rest of the world out for the most comfortable sleep you could previously only dream of having. Mongolian Fleece Lining. Mongolian fleece is renown for its luxuriously fluffy look and feel. You’ll never be cold and always be snug as the whole hoodie is lined with the fluffiness of mongolian fleece. Big Hidden Zippered Inside Pocket. You’ll always need to carry a few things and the chill hoodie will always have you covered. There’s enough space to tuck away everything you need with a zipper to make sure it’s always safe and sound. Earphone Opening. Listening to your favourite tunes is a fundamental part of “chilling”. Our eyelet earphone opening makes sure you can listen to your tunes without having to worry about your earphone cable dangling and tangling irritatingly around you.